Cheesecake Factory. The finest restaurant in which Conor has binged and purged. I'm not truly certain why it happens. I have an inkling. But it does happen. Not every time, not every month, but often enough. We'll go out to eat, and Conor winds up giving back some or much of what he ate. See, we eat out each Wednesday night. I don't remember how it started, but our routine is to go out to eat on Wednesdays at a rotating list of restaurants. Red Robin, a local spaghetti joint that thankfully closed, Outback Steakhouse, you get the drift. Listen, I'm certainly not going to complain about not having to cook dinner and do the dishes. And trust me, it's quite an accomplishment to have a child on the spectrum who can go to a restaurant for a meal. Not everyone can say that. Vomiting at Red Robin? Ok, I get that. Trust me, I get it. Outback Steakhouse? Ok, I can see it. All that G'day Mate and Hallo Sheila! is enough to make me nauseous. But The Cheesecake Factory? 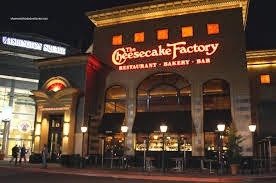 The Cheesecake Factory? What's he got against The Cheesecake Factory? We sit. He gobbles bread and fat pats of butter. We try to limit him, lie to him and tell him that we need all those extra pats of butter we tell him he can't have. We slip them into our pockets, finding the forgotten butter bombs hours later. He slurps down two huge glasses of raspberry lemonade, the kind with the sugar around the rim. The waitress, she keeps bringing them to him without us asking. He inhales handfuls of french fries with ketchup. He shovels bow tie pasta with marinara sauce into his mouth. We cajole him to slow down, take a breath, take a break, please, you don't need to eat so much. Please, honey, please don't eat so much. Drink slower, don't gulp. Then he gets The Look. If you're a parent, you know The Look. Hell, if you were in a fraternity, you know The Look. "Conor," I ask him, rubbing his back gently as he leans forward. "Are you feeling ok? Do you need to go to the restroom?" "No!" he says. "I don't want to be sick." He wraps his arms around his ample belly. "You don't look like you feel well, sweetie," I said. "Are you eating too much pasta? That might make your tummy upset, eating too much." "No!" he replies loudly, his voice raspy with puberty. He rapidly, defiantly shoves the remains of the bow tie pasta into his mouth. He swallows and sits back. "There," he continues, "I finished it." "Ok, honey. But we're going to go to the bathroom now," I say firmly and stand up. We walk, him in front, my hand on his back, wending our way through the other diners. He's with me, we have to go into the women's room, at least if he's going to vomit. So I can hold his hair back. He heads for the large white sink with the silver sparkling faucet. Grasping the edge of the Corian counter, he belches loudly. "Conor," I implore quietly, "why don't we try the toilet?" "Ok," he acquiesces. I'm surprised; he's never agreed before. 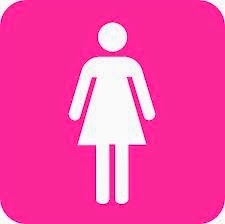 We brush past an older woman-of-a-certain-age who seems only a bit aghast at the sight of a 15 year old man/child in the women's room. Thankfully, the large wheelchair accessible stall is empty, and I quickly lock the door behind us. Standing upright, he vomits into the still, clear water, keeping the mess to a minimum. I'm not excited about the prospect of having to wipe up a public toilet, but I do what I can. Years of coping with Conor's bodily fluid output has given me a sad sort of expertise in this area. I can tell from the, uh, lack of volume that he hasn't cleared out his stomach much at all. To be frank, I doubt this bit of stuff even hit his stomach. He's done, he announces. He wipes his mouth on the back of his hand. He's ready to go back to the table. He raises his hand for a high-five. "Wash your hands, sweetie," I say. "Let's go wash your hands."